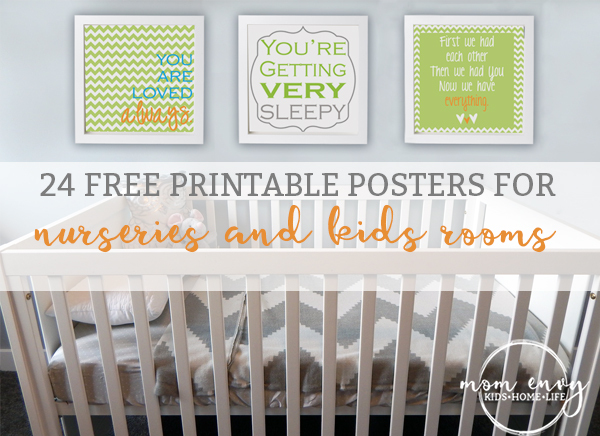 I love Nurseries and little kids rooms – I think they are so much fun to decorate. I find myself looking at and pinning ideas for our nonexistent other children. 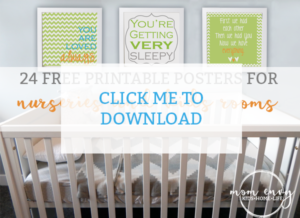 About a year ago, my Mom asked me to create some prints for her friend who was designing an adorable nursery in gray, lime green, turquoise and orange. The color combination was so much fun to play with (which is why you’ll see various versions of the same prints). They own Yorkies so I decided to add a personal touch by creating prints with a Yorkie silhouette. In addition to the colorful prints, I also created a Red Sox Print using Skip Hop’s Owl from Treetop Friends. Even though we’re die-hard Orioles fans, I set aside our differences to create some adorable Red Sox Owls for her nursery. If you’re printing at home, print on cardstock, art matte, or photo paper for added durability. Some of these files are square in shape. If you are sending your files to a printer, you will have to select the correct size to match your frame. So if you want to print an 8 x 8 square print, print an 8 x 10 and trim the excess off. These frames are perfect for these prints. You can order them in singles or in multipacks to save money. Don’t try to save the images above to print. They are low resolution and also include my watermark. Unless you want grainy pictures in your home with the name of my blog, I’d click below. Love the prints so cute! !